Henrietta Mabel May studied with William Brymner at the Art Association of Montreal (1909-1912). Subsequently, she traveled with Emily Coonan to Paris, where she was particularly influenced by the Impressionists. Following her studies in Paris, she returned to Montreal and she became an Associate of the Royal Canadian Academy (1916). In 1918 she painted a number of works of women working in ammunition factories for the Canadian War Memorials. In 1920 she became a founding member of the Beaver Hall Hill Group. 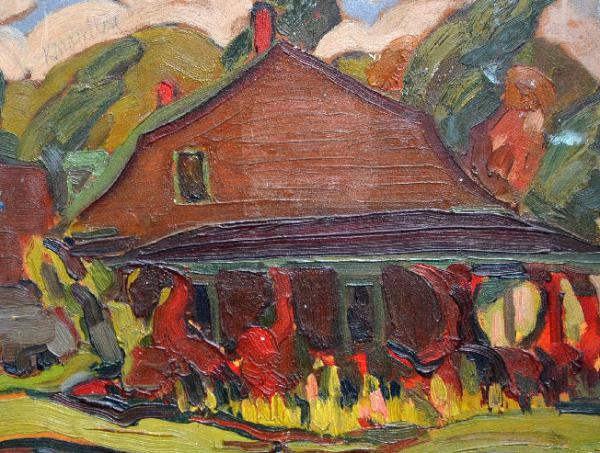 In 1933 she was a founding member of the Canadian Group of Painters. In 1938 she was appointed supervisor of children’s classes at the National Gallery of Canada. She retired to Vancouver in 1950 and there she had a retrospective show and sale of one hundred of her paintings. Although Henrietta Mabel May’s date of birth is often stated as 1884, she was in fact born on September 11, 1877 and was ninety-four years old at the time of her death.